Help is only a phone call away. All of the Counseling Center's offices can schedule inake appointments for you by calling during normal business hours. During your intial telephone contact some basic information will be gathered such as your name, address, telephone number and your type of insurance if you have any. Insurance information is necessary to assure you are assigned to a therapist covered by your insurance plan. The first visit will be a bit longer than usual because we need some time to enter information into our patient medical record system, review our privacy policies, and make arrangements for proper billing. You will initially spend about 30 minutes with our Intake Secretary who will set up a patient chart, review our fees, and collect payment information. This may take a little longer than it would in other medical offices because we set aside additional time to determine if you qualify for any special assistance with your fee. Once these things are completed, you will meet with one of our therapists in a private session focused on your individual concerns. How is my fee determined? 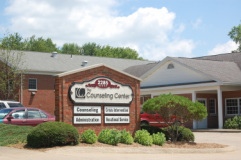 The Counseling Center accepts Medicaid, Medicare and most private insurance plans, including Worker's Compensation. If you do not have Medicaid, Medicare or private health insurance, or if your plan does not cover all of the services that you need, you may qualify for special assistance from the local Mental Health and Recovery Board which can reduce your fees. Fee reductions are calculated based on income and family size. In order to determine if you qualify for any fee reduction, you will need to bring your insurance card, if you have one, along with some documentation of your family income, such as a pay stub or tax form, and something that documents that you are a resident of Wayne or Holmes County. A copy of a utility bill in your name or a driver’s license is usually adequate for this purpose. Fee assistance is limited to persons who are currently residents of either Wayne or Holmes County. What will the intake therapist do? Your therapist will review the reason you are here, collect some background information that will help us understand your unique situation, and work with you to develop a personal treatment plan based on your unique needs. As part of this plan, the therapist should be able to tell you approximately how many appointments will likely be necessary in order to successfully address your major concern. In addition, your therapist may link you to one of our specialty programs. If your therapist does not provide you with specific treatment recommendations, or if you do not understand their recommendations, please do not hesitate to ask for more information. What if I have to cancel or change my appointment? Because we set aside a large block of time just for you, it is important that you let us know if something changes and you are not able to keep your appointment. Please call any of our offices or our main schedule desk at 330-264-9029, at least 24 hours in advance, if you need to cancel or reschedule your appointment. What if I have an emergency and can’t wait for my appointment? The Counseling Center has a 24-hour emergency service. You can reach our emergency staff by calling the Wooster office (330-264-9029) at any time and asking to speak to a member of our Crisis Team. If you forget the number of the Wooster office, you can dial the phone number for any of our office locations, any time day or night, and someone will assist you. What if I have other questions or problems? If you have any questions about our services in general, please contact our office and ask to speak to the Intake Secretary. If, at any time during your treatment, you have any problems or concerns with our services, you can contact our Chief Operating Officer, David Stauffer (330-264-9029) who will work with you to resolve your concern. We understand that it is not always easy to seek help and we are dedicated to making your experience as positive as possible.